In July, Mayor Adams announced the formation of a task force whose purpose is to make a recommendation on how to revitalize the Rose Quarter and what to do with the aging Memorial Coliseum. In August, the 32 member Rose Quarter Stakeholders Advisory Committee members were announced and Eliot Neighborhood was identified as a stakeholder. Do you have a great idea for an article in the Eliot News, the Eliot Neighborhood newsletter? Do you like to write and want to contribute an article? Do you have something you want to get off your chest in an “Editorial” article? Continue reading Wanna Help Eliot News? 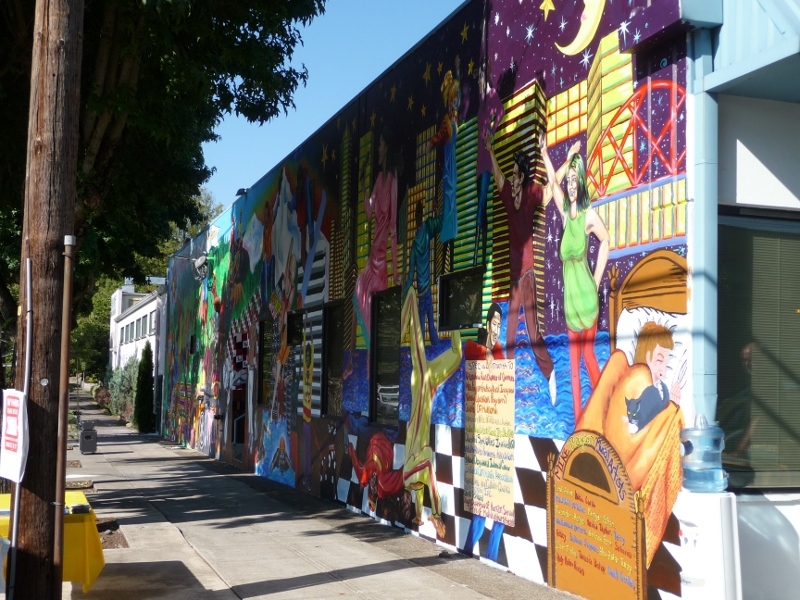 In the past year the west wall of the Northeast Portland Renal Center on Northeast Seventh Avenue at Hancock Street has undergone a dramatic change, from solid white to an explosion of color. Its many images each convey a message, while the total enterprise, the work of many people, meets so many purposes. As a real estate agent focusing on Portland’s many “close-in” neighborhoods – some newer that are up and coming and others that are already established – I’m tasked with ongoing research about what each has to offer. It is important to show new Portlanders all of their neighborhood choices to help them make their big decision. My pitch when describing Eliot is that “I have lived here since 1994 and don’t plan on going anywhere anytime soon.” I am sold on our central location. I point out how we have such easy access to the freeways, 2 Max Lines, and many bus routes to choose from. Not to mention the bike corridor on Williams and Vancouver and plans for Street Car in Eliot one day as well! I fall more in love with our neighborhood every year. While walking through the neighborhood, I’m able to take in all of the new things that are going on, like home renovations, amazing gardens, and the new businesses. By winter Eliot will have new infill housing that is as old as the neighborhood. Let me explain. The call came in mid-2007, “Want to move another house? 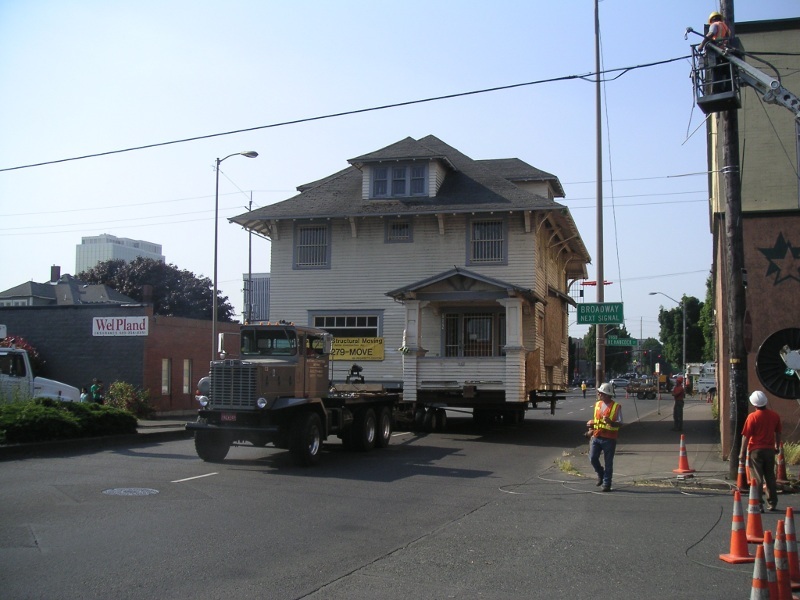 I have a lot and we can go 50/50.” The Kinsman house was built in 1908 near NE 7th and Broadway and was recently used as an annex to the Mountain Shop. It is a large building – and tall. Unfortunately, the available lot in Eliot was 10 blocks away down tree-lined streets. So the first order of business was to find out what route had both the width and the fewest trees. Next we tried to discover what the City’s tree trimming/cutting policy was for house moves. Six months and a letter to the Mayor later, we finally got a response, “We won’t tell you until you have your building permit.” Thus began the first of many Catch-22 situations we had to resolve. Although the City’s building move process is better than is used to be, it is still poorly implemented.